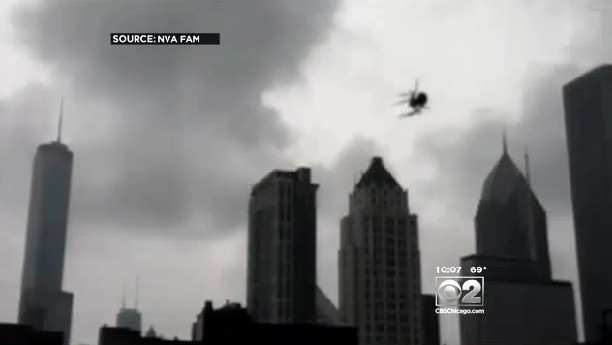 CHICAGO -- If you're afraid of spiders, the last thing you probably want to hear about is a flying spider. So you may want to think twice about staying at a posh downtown hotel in Chicago after seeing the flyers they've been passing around to guests. A note to guests at the Hilton Chicago Magnificent Mile Suites, shared on Reddit, suggested that "you not open your windows in your suite during this time, to avoid the annual migration of high-rise flying spiders, a Chicago phenomenon." CBS Chicago reports that the city's high-rises, including the Willis Tower and the John Hancock Center, are subjected to an annual influx of flying spiders as high as 95 stories above the ground. The spiders apparently are attracted to high-rises because of the lights inside at night. Flying spiders -- a type of orb weaver spiders commonly known as bridge spiders or gray cross spiders -- technically don't really fly; the baby spiders spin balloon-like webs, which are caught by the wind and travel great distances. When fully grown, the spiders are pretty big, about the size of a half-dollar coin. Though they may make Chicago residents shudder, the flying spiders play an important role in the environment, says Steve Sullivan, the senior curator of urban ecology at the Notebaert Nature Museum. "Spiders are a wonderful part of our neighborhood ecology. If we didn't have spiders, we'd be neck-deep in flies by early summer," Sullivan said. That's little solace to arachnophobes, as evidenced by some of the over-the-top comments posted online about the Hilton's memo. Some readers' suggestions ranged from calling room service to order fire, to calling for a strategic nuclear attack on Chicago.